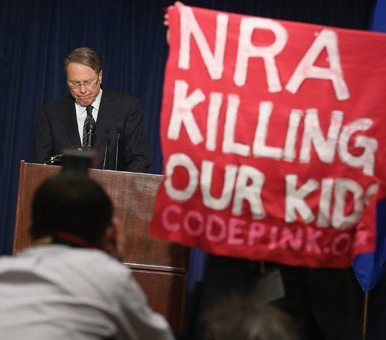 After emphasizing that the National Rifle Association of America is made up of “4 million mothers, fathers, sons and daughters,” LaPierre blamed movies, music videos and video games like Grand Theft Auto (Saint’s Row is probably worse), Bulletstorm (only purchased by fans for the Gears of War 3 beta code), Splatterhouse (no one plays that anymore) and Kindergarten Killer (no one ever played that). “Politicians pass laws for gun free school zones, they issue press releases bragging about them. They post signs advertising them. And, in doing so, they tell every insane killer in America that schools are the safest place to inflict maximum mayhem with minimum risk,” LaPierre explained. He went on to say that “The only thing that stops a bad guy with a gun is a good guy with a gun” and, in the most memorable moment of the speech, called for “armed police officers” to be deployed “in every single school in this nation” by January. Forget that the solution doesn’t help the astonishing amount of gun-related crimes that don’t happen in schools and that stricter gun laws, not more relaxed ones, have proven to work in countries like Japan and Sweden. Many say that blaming the NRA for gun violence is like blaming AAA for car accidents, but I think it’s more like noticing that they put way too many cars on a one-lane highway and handed all the drivers whiskey. I don’t care if you’re an association made up of Keebler elves, you’re doing the wrong thing. All I’m asking for is a goddamn day-long course and a mental test for gun owners. 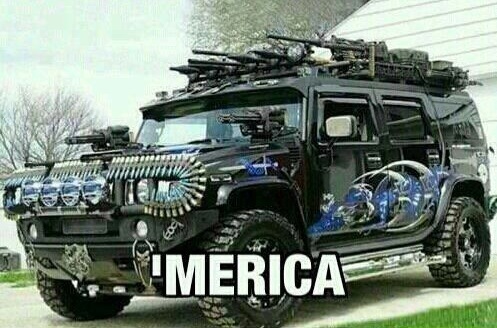 Oh, and no automatic weapons whatsoever for civilians. Guns kill people, and people can kill guns. Read: If Gun Control Doesn’t Work, Why Does Congress Need Metal Detectors? Americans are not like Jesus being like the roman army being like the religoins at the same tome. They trust in weapons. What has the outcome of that been time, and time again? isn’t it time we saved our soul being to the world foolish, but being to God wise?